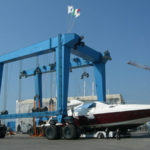 Wharf travel lift is mainly used for lifting, transporting and maintaining vessel. It is amphibious, can be used in the water and on the land. 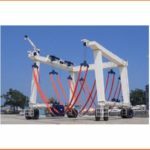 This boat hoist has compact system, it includes main structure, hoisting mechanism, travelling wheel block, steering mechanism, hydraulic transmission system, U structure frame and electric control system. Simple structure makes boat hoist easy to operate, convenient to maintain and fast to install. Ellsen Group, a professional and reliable travel hoist manufacturer in China, supplies top quality marine boat hoists for sale, such as factory direct sales marine travel lift, ISO approval marine travel lift, safe driving steady boat hoist, remote control travel lift, cabin control travel lift, all-wheel steering boat hoists. 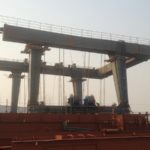 All these mobile gantry cranes are designed and produced according to practical needs and requirements. Reasonable design, ideal quality, low price! 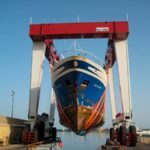 Buy the most suitable marine travel lifts from Ellsen! Want to increase efficiency? Worry about high price? Get great choice for Ellsen boat hoists now! 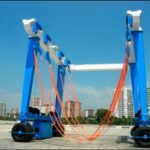 Wharf travel lift has wide application, because it has many advantages to make lifting work easier and safer. For price, Ellsen provides wharf travel lift with factory price. The more travel lifts customers purchase, the lower price customers have. Customized service leaves great experience. 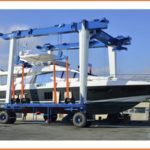 For convenience, wharf boat hoist has many lifting points. Soft and firm belts connect these points. They can work at the same time when the machine is lifting vessel. In this way, travel lift can increase efficiency and protect boat safety. 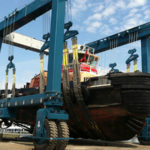 For smooth move, wharf marine travel lift has all-steering wheel. It can move with 360 degree easily and flexibly. It can also climb gentle slope steady. 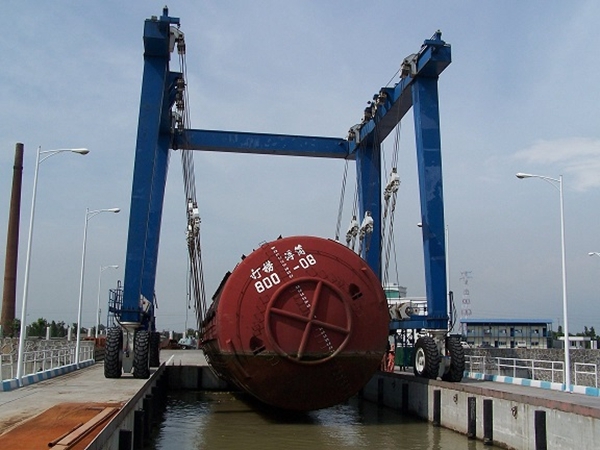 For durable material, wharf boat hoist has anti-water, anti-corrosion material. Travel lift touches water frequently, durable material can ensure long service life. Ellsen wharf travel hoist is a cost-effective choice! 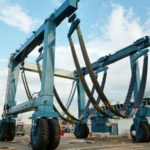 It can deal with light lifting duty and heavy lifting duty well!